This is part 1 of a 2-part series on how LEED has evolved over the past decade. Using the Environmental Defense Fund’s Washington, DC, office as a comparative basis, David Kay and Carissa Gavin dig into the requirements for certification as they have progressed with new standards and technologies. The Environmental Defense Fund (EDF) likes to lead by example. It’s an environmental organization that works closely with major corporations to find economically viable and environmentally responsible solutions to problems. Over subsequent years, as EDF grew out of planned-for expansion space, it located additional staff in non-contiguous offices on other floors within the same building. So in 2010, when EDF decided it wanted to consolidate staff into one suite, it returned to Envision Design for design services. Presently, EDF is seeking Gold-level certification for the renovation and expansion of its office space under the LEED-CI 2009 3.0 rating system. As such, the EDF office provides an opportunity to take a comparative look at the differences between the LEED-CI Pilot Program and the current LEED-CI 2009 3.0 rating system. In doing so, we can see how increased environmental awareness and demand has changed the sustainable market over the past 10 years. Now that the project team has nearly completed the LEED-CI documentation, a look back at the LEED Pilot Program reveals changes in LEED requirements and building codes that have impacted both the original and renovation project certifications.Ãƒâ€š Selected LEED-CI credits are compared to illustrate changes in the credits from then to now. Originally there was no water efficiency prerequisite in the Pilot Program, and points could be achieved for 20% and 30% reduction in water consumption versus the code baseline. Under CI 3.0, the prerequisite is set at a minimum of 20% reduction from baseline, with up to 11 points available for various percentages of reduction. Since EDF does not occupy an entire floor, the base building fixtures were not factored in the credit documentation. However, the design team specified .5 gpm aerators on the tenant faucets to ensure that the prerequisite would be met. Additionally, the most water conserving and energy efficient dishwashers on the market were specified; though this is not specifically rewarded in LEED it supports the organization’s mission of low energy consumption and water usage. This credit now offers up to five points, one for each reduction value of 15%/ 20%/ 25%/ 30%/ 35%. The code ASHRAE/IENSA 90.1 guides the baseline requirements for this credit. ASHRAE/IENSA 90.1-1999 was in effect at the time of the Pilot Program, resulting in a lighting allowance of 1.3 w/sf using the building method calculation. In contrast, the current maximum allowance is 1.0 w/sf. The 2001 project achieved a lighting power density of .82 w/sf, a 37% savings. LEED-CI 3.0 offers additional points for daylight responsive controls, in addition to the previous point in the Pilot Program granted for installing occupancy sensors. To achieve greater energy savings in the new renovation, the team specified vacancy sensors for the entire project. Vacancy sensors require users to turn on their overhead lighting at the wall switch while turning them off automatically after a set interval when no one is present. Most employees rarely turn on the overhead lights, preferring instead to use task lights if needed. The current rating system offers more points at varying percentage values between 70% – 90%, up to a maximum of four points. The original EDF project didn’t achieve any points for this credit, though they consciously tried to specify energy star qualified equipment if available. Since then the market for energy-star qualified equipment has significantly increased, which makes it easier to attain points under the 2009 system. EDF started a full upgrade of their computers in 2010, specifying only energy star qualified computers and laptops. This upgrade supported the organization’s mission and later contributed to achieving the maximum of 4 points for the renovation project. This is one credit in LEED CI that has become less stringent since the Pilot Program. The Pilot Program offered one point for 50% and one point for 70% reuse. Now one point is awarded for 40%/ 60% respectively. This change recognizes that this credit is difficult to achieve. The 2011 EDF renovation project maintained 46.18% interior nonstructural components. 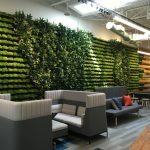 This was achieved by retaining, salvaging, or relocating most of the existing office infrastructure, millwork office furniture and workstations. The percentages of recycled content required to achieve points have increased from 5%/ 10% to 10%/ 20%. Over the past ten years manufacturers have invested heavily in the R&D and technology to reduce and recycle waste. As a result, it is much easier to find products with high percentages of recycled content than it was when we designed the first EDF-DC office. The Pilot Program combined daylight and seated views into one two point credit, requiring a minimum daylight factor of 2%, seated areas had to have access to outside views, and windows had to have glare control devices installed. LEED 2009 separates the day lit spaces and seated views credits and limits obstructions to 42” in height. The current LEED CI rating system has added location specific regional bonus credits.Ãƒâ€š These can net a project up to 4 additional points.Ãƒâ€š The regional points achieved for the 2011 EDF renovation project are IEQc6.1 Controllability of Systems – Lighting, and IEQc7.1 Thermal Comfort – Design. At the time of the 2002 project, the demand for eco-friendly materials, finishes, FSC solid wood and veneers, and GREENGUARD-certified furniture was just emerging. Due to the limited options available, the design team had to be innovative to meet the project criteria that the materials have a minimal environmental impact, be regionally manufactured, and have high-recycled content. The same guiding principles were used in the renovation project. The finishes highlight changes in the sustainable design market over the past 10 years. Due to the lack of environmentally friendly office furniture in 2001, the design team had to custom design millwork workstations, office furniture, and conference tables utilizing the eco-friendly materials that were available at that time: FSC wood, wheat board, wood fiber countertops, and biocomposite board made from agricultural waste such as sunflower seed hulls. These panel products were formaldehyde-free materials and finished with a VOC free system that was UV cured. Some of the early products and finishes performed well, but others were not as durable as hoped for. Today, designers are able to take advantage of a much greater range of materials. Envision was able to specify composite wood and agrifiber products containing no added urea-formaldehydes with 100% recycled and/ or 100% FSC wood content. The new workstation, pantry, and copy room millwork uses plastic laminate that contains FSC certified fiber. The laminate provides a more durable finish than the UV-cured clear coat finish that was available 10 years ago. The natural beauty of wood was integrated into the 2001 EDF project at the workstations, office furniture, credenzas, and for the wood paneling at the reception area. At the time, only cherry veneer was available with FSC certification in the quantity and quality required for the project. Today, FSC solid wood and veneer options are greatly expanded. For the 2001 project, Envision specified custom broadloom carpet with high-recycled content at offices and corridors, recycled rubber flooring at the exercise room, and rapidly renewable bamboo flooring in the reception area and corridor adjacent to the conference rooms. Many environmentally friendly carpet options are now available due to tougher environmental regulations and market demands placed on the carpet industry over the past 10 years.Ãƒâ€š These demands have positively forced the industry to become more innovative in terms of the recycled content used in carpet. They also have led to green technological advances in textiles, adding to more environmentally friendly options on the market. By specifying all NSF ANSI 140 carpet, designers may achieve a LEED CI v. 3.0 Innovation in Design credit if minimum quantity criteria are met. Reusing furniture is the greenest option available; it conserves waste and does not emit high levels of VOCs.Ãƒâ€š Envision was able to reuse existing furniture extensively for both the 2001 and 2011 projects, including used task chairs and storage. High or 100% recycled content fabrics were specified for the new furniture. In total, the 2011 project reuses 58% of the existing furniture. While the USGBC has continued to raise the bar for certification and many of the codes that LEED-CI references have become more stringent, it is possible to achieve a higher rating for projects under the newer versions than was possible under the first LEED-CI Pilot program because technology and materials that contribute to the LEED points are much more pervasive and cost efficient than ten years ago. How we did this in the EDF renovation will be detailed in the next-and-final part of this series.